Your team leader or team player no matter the scale of your aquatics project. iSlide, the Dutch waterslide special effects company that uses total interactive technology to create true interactive gaming experience in the slide and other unique aquatic rides, is now available in North America. Why choose the iSLIDE for your next waterslide? It’s the world’s first interactive, special effects and social media gaming waterslide experience! It provides direct social media interaction which translates to increased traffic to your web site as well as multiplied referrals to your venue. Easily customized to your facility’s theme and marketing model. It will increase your attendance! THE way of creating social media traffic !!! This is the way of reaching the public, by using interactive gaming, photo and score > social media and organizing interesting events you will reach and entertain the audience. This in combination with active social media campaigns (we can provide) you will generate a lot of traffic and clientele. “The customer experience at our facility/waterpark is our highest priority!” This might be your objective and mission to try and attract increased visitors and repeat business, but present day water park visitors and slide users are looking for new and unique waterslide thrills and experience. iSlide enables you to introduce the FIRST true interactive gaming waterslide experience currently available on the market; turning your ordinary waterslide into a star attraction that will generate many repeat rides and return visits to you facility. So you want to compete with the newest waterparks or community pool facilities offering the latest thrill slides and waterslide rides. Building a complete new slide for hundreds of thousands of dollars may seem to be the only logical option. That’s a pity, because your current slide could still be perfectly useable for many years and still provide user thrills without having to replace it. Installing a custom iSlide gaming package into your existing slide more than equals that new spectacular replacement waterslide you were dreaming of at only a fraction of the cost. iSlide offers an entire range of light, sound, ambiance and 3D projection effects that can be easily mounted into your existing slide. Your slide will never be the same again. Users will be able to choose from a wide range of themes and special effects so that each ride can be different. Our unique sensor system will exactly track and surprise the sliders each time they go down the slide. Every time again and again. When was the last time you noticed that an attraction at your site was really popular? Adding iSlide components to your slide, and you will not know how you could ever have operated your facility without iSlide. iSlide will totally transform your slide into a total waterslide/ride experience that will have people talking about their experience for days to come and then they will return to try and better their score and achieve new thrills. iSlide puts your customer/clientel back in control. At the start of the slide, your users can select from a range of light/sound/ambiance options for their next ride. Taking a ride is no longer a dull moment; trying all the available combinations will work magic in bringing your users back for more thrills. iSlide comes with nearly endless capabilities for gaming and interactive content. Changing ride themes or content requires no hardware changes. iSlide can offer new themes or make changes to the lighting, sound effects whenever you need, and even provide on-demand content management. With the iSlide system, the iSlide camera that captures the most spectacular moments of the ride with using cutting-edge photo or video technology. When a game module is in progress, slide speeds and game scores are embedded in the pictures. Users can see their pictures and results on large iSlide TV monitors in the pool area. Of course these monitors can also display your advertisements and other revenue generating promotions. Users can also buy the photos and video, thus resulting in extra revenue for your operations. iSlide will also be your new marketing machine. Seeing, sharing and buying photos requires a user to login to your website and enter his/her email address. Building a database with the resulting customer data has never been that easy. iSlide components are specially made to meet the extreme conditions in pool area environments and on waterslides. Our interactive touch sensitive gaming units are completely water sealed, unbreakable and each unit has a spare unit already in place in case a unit breaks down. Exchanging a unit is simple. All components are being driven by a central system. All units are programmed to fall back to an internal program in case of network failure. With iSlide your system will never go blank. The best reason in our top 10 reasons why you need an iSlide system at your community pool, waterpark or aquatic attraction is that it is new and exciting like when the first Apple IPAD was introduced. It is affordable, state of the art technology and will rejuvenate your old slide and bring you immediate market exposure and recognition. When our first iSlide went into the small town of Meppel in Holland, within a month attendance had increased over 25%, concession sales increased as well, and the pool’s website was getting over 50,000 hits a month. But most of all, this older municipal pool facility was suddenly attracting visitors from larger cities more than 1 hour drive from Meppel. iSlide is an attraction designed and built based on social media, and as such it will attract all kinds of media attention for your waterpark or pool facility. Waterslides will never be the same! According to iSlide Founder, Edwin Keijzer, from Rotterdam, ‘waterslides will never be the same now that you can add iSlide technology into any existing or newly developed slide’. The I iSlide technology uses electro / audio visual components that are totally water resistant and fully tested prior to installation that puts special effects into any waterslide. In the Social Media Package the pictures or video’s taken will automatically be placed on customized webpages. iSlide technology allows the user to play AQUA SMASH, an interactive game with real time scoring, or a streaming video projection in the slide to swim with dolphins or escaping a pirate ship, or any other of a myriad of special effects programs to be chosen on an interactive touch screen at the slide start. These programs can be themed to your specific waterpark or waterslide and can be changed over the internet through our on line content management program. 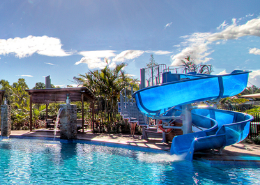 There are many choices in putting together the right iSlide program for your facility, your waterslide depending on your budget or the special effects you want to achieve. You can start with an entry level special effects program and than over subsequent years easily upgrade and expand the effects and experience in your slide. iSlide originates from another special effects company that Keijzer had started over 17 years ago. That company installed some of the first fiber optics effects into slides in locations such as the World Waterpark in Edmonton, Canada in 2002, at the West Edmonton Mall. Presently, there are hundreds of tube sensation installations and dozens of installations of the new iSlide FX programs which incorporates all of the interests of the new generation of waterslide users; gaming, competition, interactivity, social media connections. For those venues already having installed the iSlide program, they have achieved awesome results in terms of increased visitor use at their facilities; increased social media publicity, and increased revenue. iSlide has established an office in North America working with long time aquatics industry representative, Bart Deeg from Aquatics by Westwind. iSlide North America is looking forward to introduce waterpark owners and operators our special effects program which we can customize to your specific theme or needs.